Why was the family of Bilga different? One answer the gemara gives (Sukkah 56b) is that Miriam, a daughter of the Bilga family, married a Greek soldier in the period preceding the Chanukah story, when the Greeks sought to destroy the Beis haMikdash. The Chachamim therefore decreed that the Bilga family would have this difference listed in the mishna, apparently so that the family would be embarrassed by it during their service in the Beis haMikdash. Though it was just one girl in one family of the Bilga clan who married out, the gemara says that she reflected her parent’s values and her parents represented the values of their extended family. Therefore, everyone in the Bilga family was punished for the actions of just one person – oy l’rasha, oy l’shcheino. In an essay I wrote last year for Kol Hamevaser, I examined this piece of aggada and focused on why the punishment for the Bilga family was, lechorah, to pain them for generations. I answered that the Chachamim were trying to fix the culture within the Bilga family by getting them to interact with other Jewish families, which would be necessary if the family couldn’t use their own materials for the avoda in the Beis haMikdash1. In this essay I would like to present a machlokes between Rashi and the Rambam regarding the details of the punishments, as explained by the late Lubavitcher Rebbe, which adds to and deepens this point. The last two punishments stated the mishna are that “their ring was fixed and their window locked.” What was the purpose of both the ring and window? Rashi explains that there were 24 rings for each family of Kohanim, which were used to secure the head of the korban to be able to assist proper shechita. Bilga’s ring was closed up so they had to use a different family’s ring. The window, says Rashi, was a cubby that held the family’s slaughtering knives. However, the Rambam, in his commentary to the mishna, explains that the ring was not for the slaughter itself but for the flaying of the skin of the korban, and that the window was not for knives but for bigdei kehuna. The Lubavitcher Rebbe explains the machlokes to revolve around the essence of what it means to be neighbors — a machlokes in the din of shcheinus. Does shcheinus create an internal relationship between individuals, such that one person’s actions change the essence of the group, or is shcheinus an external definition of the group, nothing more than individuals being grouped together? According to Rashi, the punishments of the ring and window applied to women as much as it did to men, as women are technically allowed to slaughter korbanos, and the ring and knives were used for slaughtering. He appears to see shcheinus as being external. Miriam’s actions did not affect the essence of the shcheinus itself, and the punishment only came to the entire group because they were all externally within the geder of shcheinuse. Therefore, Miriam herself had to be effected by the punishment for it to make sense. It could be that really Rashi and Rambam agree that there are these two ways of looking at shcheinus, but they differ on how the Chachamim approached the problem of the Bilga family practically. According to Rashi, the punishment was meant to broadcast the individual cause of the sin, Miriam, and this would keep the rest of the group from doing this in the future. Miriam needed to be included in the punishment for the full message to be expressed. According to the Rambam, however, their solution was to clean the culture of the group as a whole, since the whole group was infected, and Miriam was just one symptom of this. The inner essence of the group needed to be changed, far beyond just Miriam herself. As a mussar haskel, though sometimes we feel like individual Jews grouped together at YU, we are also a collective with an inner essence that should be cultivated for holiness. 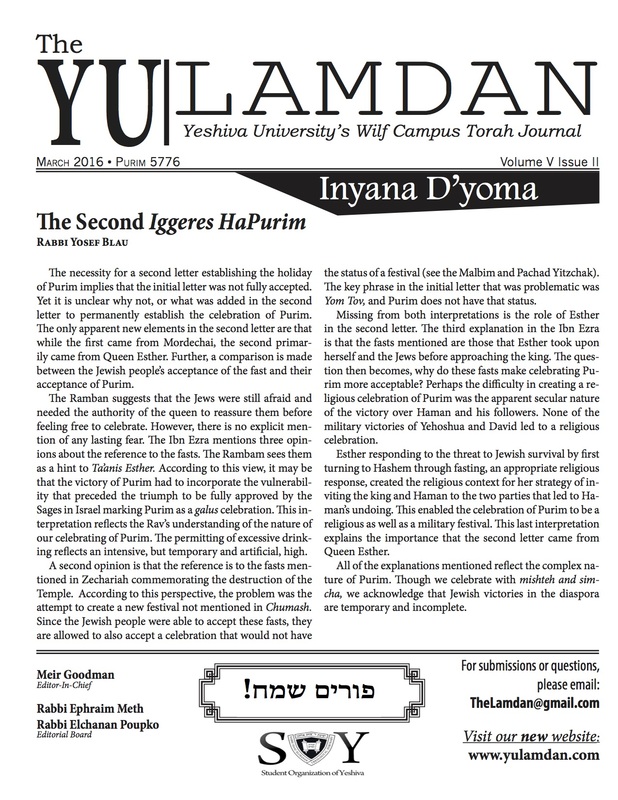 2 See HaMaor, Vol. 34 No. 6 Av 5742. The Rebbe applied this chiluk to the din of bar metzra as well as tosefes Shabbos and tosefes Yom HaKippurim, which have nafka minos based on this.